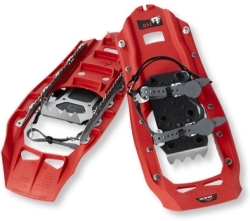 If we’re talking about the best value for money, MSR Evo 22 is down right the best snowshoe. Its performance on various terrain conditions easily outweighs its price tag which is less than 150 bucks. Some new snowshoers may think that it’s expensive but for your info, there are a lot of other pairs out there with no better performance sold for far more. As a budget-oriented snowshoe, MSR Evo certainly has its shortcomings but they’re nowhere close to being awfully disappointing. You still get to enjoy carefully engineered snowshoes that would last you a few winters. Interested already? Check out the details about them below! Like all MSR Snowshoes, MSR Evo has no discrete frames. The whole construction consists of plastic decking molded together with traction system right below it. Length measures in 22-inch while width is set at 8-inch. That would offer fantastic agility on-trail where the snow is mostly groomed and packed or, in the worse case, broken. The design is modular too. I mean you can connect it with an add-on tails to enlarge its footprint, hence, improving its flotation in powdery situations. The plastic composite used to build this snowshoe isn’t just regular compound. In terms of ruggedness, you’ll be surprised to know how much it can take a beating. Rocks hidden under soft powder are simply no match for its durability. However, like what happens when plastic hit a hard snow surface on the trail, MSR Evo makes quite the noise. Still, not a deal breaker I suppose unless you use it for hunting. This is where MSR Evo shines on the brightest. It’s hard to find a recreational trail walking snowshoe that has traction system as grippy as this one. It features a pair of side rails that run parallel to the extent of the decks, molded brake bars, and toe crampons. The toe crampons have a total of four teeth that dig deep into crusty snow. As you put more pressure with each step over a slope, they’ll grip even harder. Someone even told us he could tackle a 40-degree incline on icy track without a single backward slipping. That’s kind of what you expect if you buy snowshoes from MSR. 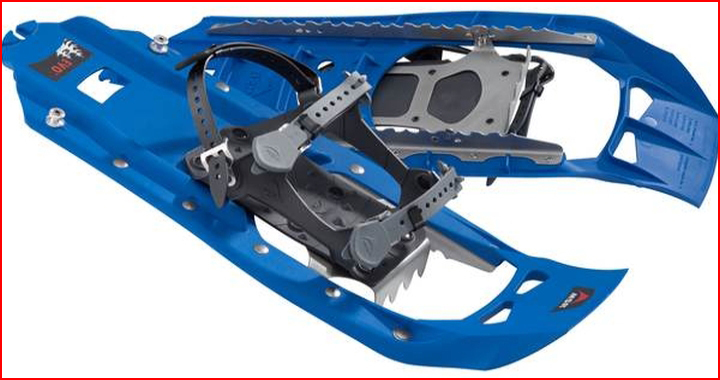 The bindings on MSR Evo are quite similar to those of MSR Lightning Ascent, only with less straps securing your arch. Instead of three, this snowshoe’s only got two of them. They’re still made of freeze resistant rubber-like material that won’t budge once you set them right. You can wear literally any type of footwear and of any size that comforts you the most. With only a length of 22-inch, MSR Evo isn’t very suitable for snowshoeing on deep powder. Its flotation only rates to 180 pounds max. That includes your weight and your backpack. Luckily, it does come with an add-on flotation tail that extend its length to 6-inch. With the add-ons attached, you should have better experience on deep snow than you would without them. Just a quick note, these add-on tails are sold separately and you must take off the snowshoes first before you can put them on. Still not convinced? Find out how MSR Evo 22 trail snowshoes fares compared to other snowshoes in our list Top 10 Best Snowshoes of 2017.